Last night, what you most likely heard was not your neighbour smashing a plate, but the sound of millions of mid-twenty-year-olds’ hearts around the globe shatter into a million pieces. It was when MySpace admitted to having lost over 12 years worth of music, meaning 50+ million songs by 14+ million artists from 2003 to 2015 were—just like that—vortex-d into the infinity of the internet, lost and untraceable—gone for good. “As a result of a server migration project, any photos, videos, and audio files you uploaded more than three years ago may no longer be available on or from MySpace,” a statement by what could be considered the first successful embodiment of the invention that’s now become essential to our lives, social media. Whereas now, our entire circle of acquaintances can be reached through messaging in the virtual, there was a time when our first and only friend on the WWW was Tom, the sympathetic white dude (and as it turns out, Co-Founder of MySpace) that’d greet you when logging in, kind of like Clippy, Microsoft Word’s infamous default assistant, the helpful paper clip. Notorious for its heartwarmingly tacky layout designs, an interface barely more appealing than straight-up html surfaces, MySpace was an online haven, an escape route from reality for an entire generation of now so-called digital natives. In 2006, it was the most visited site in the US, surpassing even Google. Next to photo sharing, wall postings, hopping through friends’ profiles or joining groups of like minded IRL-introverts, its music features in particular became a beneficial asset to many a musician. Bands and solo artists were able to share their music, events and communicate with international supporters through keeping an up-to-date profile. This would later help launch the careers of some of your then-favourite acts. Above and beyond anything else, in hindsight it seems that MySpace was the mainstream breakthrough of this world’s final, now-dead(? ), musical subculture: Emo. Spiky hair, airtight, black skinny jeans, raccoon eyes and studded belts at their visual core, emo artists arose when—or because of—MySpace’s peak. Unfortunately, it is this exact time period that has now vanished from the page’s gem-packed history. As we try to gather the energy needed to not start sobbing in daylight, we’ve curated a list of 10 iconic MySpace-era emo tracks (in alphabetical order) for you to not only time travel back to ferocious pre-pubescent melodrama, but make peace with the tragedy and thank the gods for these gifts bestowed on us. Because contrary to what some of the lyrics below may have you believe, there has to be a glimmer of positivity even in the most devastating of experiences. First up in our cast of predominantly male, exclusively white, bad-tempered heteros, we have the Arctic Monkeys. In present times easily considered one of the world’s prime Indie Rock groups, the British four-piece spent their humble beginnings spreading their music via MySpace. Although they’ve since stated this was not them, but a fan-led account, there’s no denying it helped kickstart their success, this banger contributing greatly. Seven albums into their career, Blink-182 are, to this day, renowned and celebrated for their emo aesthetics, album #5’s “I Miss You” having not only become a niche-anthem, but one of the American band’s most successful releases to date. If you ask anyone you know who’d retrospectively pass as an exemplary teen of that decade, they’d let you know that Death Cab For Cutie’s “I Will Follow You Into The Dark” is not only the most perfect, most emo acoustic ballad of recent memory, but also the secret soundtrack to every single adolescent breakup they ever had. Long before contemporary pop and R&B personas began excluding vowels from song titles, Fall Out Boy gave us the violin-accompanied head banger “Thnks Fr Th Mmrs”. And by the way, don’t miss pre-Instagram Kim Kardashian’s music video cameo. Talk about trailblazers, huh? One of the very few females to crack mainstream-emo’s surface was British singer/songwriter Imogen Heap. The video for her 2005 single, “Hide And Seek”, sees her longingly singing portrait cry against the wind, which is exactly how we’d lip-sync to it, hairbrush at hand, in front of our childhood bedroom’s mirror, thinking of that time Marissa shot Trey. After The Killers debuted with “Mr. Brightside” – a song that, as of 2016, spent 11 of its 13 years in existence on the UK charts –, they released 2004’s “Somebody Told Me”. Today, it is one of many must-haves on any throwback party playlist. Linkin Park’s “Numb” is not only one of the band’s best-known outputs, but basically the epitome of an emo hymn. Especially nowadays, not long after lead-singer Chester Bennington’s death by suicide, the lyrics become all the more piercing, a genuine exhibit of modern music history’s diamonds in the rough. Emo in its most literal sense comes in shape of My Chemical Romance’s “Black Parade”. The music video was directed by Samuel Beyer, who’d previously worked with fellow musical mopes Green Day and Nirvana. What originally started as nothing other than a Blink-182 cover band in Las Vegas, Nevada, would later become a band – more specifically a voice – that stands almost synonymously with the 2000s’ take on the emo genre itself, the freakshow-inspired music video for “Sins” being a grandiose depiction of what a then-zeitgeist felt inclined to: no-fs-given, creepy chaos. 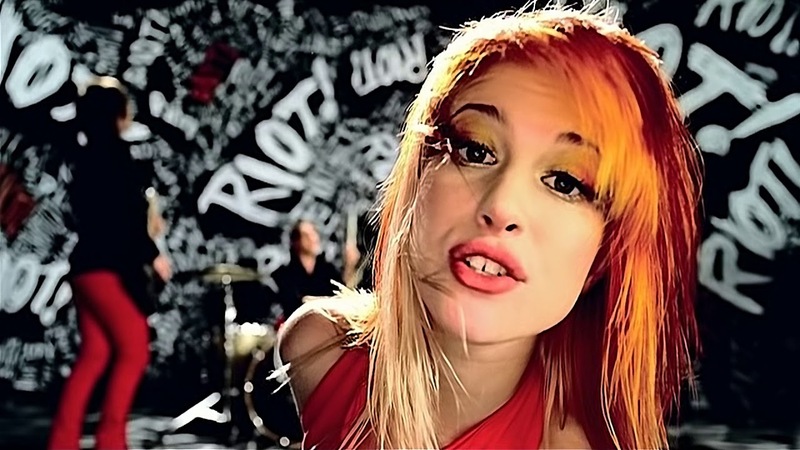 One of, if not the only female-led ensemble(s) of emo slash punk slash pop music was (and still is) Paramore. The one-time quartet’s personal history is just as tumultuous as their eclectic catalogue of well-crafted jams, but it’s their breakout hit “Misery Business” that should ring a bell, even with those of you who’ve, by now, moved into new sonic territories. While since retired from their live sets for what singer Hayley Williams now deems inappropriate wording, “Misery Business” will always be a part of our MySpace-missing, emo-tainted souls.